LAKEWOOD, Colo. – Each month, the Colorado Department of Agriculture features a different commodity to highlight the variety and quality of products grown, raised or processed in the state. 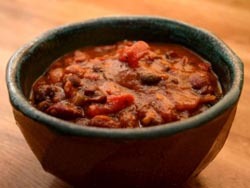 This month, Colorado buffalo is featured in our Buffalo and Bean Chili recipe. The great American bison is the largest land mammal in North America. There are approximately 450,000 bison across North America in public and private herds. Buffalo is a source of protein, vitamins B6 and B12, iron as well as other vitamins and minerals. Look for Colorado buffalo at grocery and specialty stores and at restaurants across the state. Sauté bacon. Add buffalo and garlic and cook until buffalo is browned. In a separate pan sauté onion and peppers until golden. Combine onions and peppers with sautéed meat, add jalapeno and cook. Add tomatoes, beans and seasonings and simmer for 35 minutes. Serve with cornbread muffins. Enjoy with a Colorado wine, such as a glass of Syrah from Mountain View Winery, located in Olathe, Colorado. Visit www.coloradoagriculture.com <http://www.coloradoagriculture.com/> for a complete list of recipes.